For beginner ski and snowboard families, planning a trip to the ski slopes can be a daunting task. We're not just talking about skiing itself, but everything that goes into a ski trip before skis ever hit the snow: buying or renting equipment, packing your bags, staying within budget and more. Here at Colorado Ski Country, we want to make it as easy as possible for first time skiers or snowboarders to have a great experience on the slopes. To help, we've gathered information covering everything from what to wear skiing to the most beginner friendly resorts. One of the first things to figure out when you, or your family, get the itch to try skiing is where to go. If you plan to ski in Colorado, you are in luck because there are plenty of ski resorts to choose from! Every Colorado ski resort (with the exception of Aspen Mountain and Silverton) offers beginner terrain and lesson programs to help get you started. More than 20% of terrain at Copper, Cooper and Crested Butte is rated green for beginners, but there are also many more great options out there. And remember, bigger does not always mean better; smaller resorts like our Gems Resorts often feature no crowds, cheaper pricing and a family-friendly feel.For information on our resorts, including a breakdown of terrain by difficulty, visit our Facts & Stats page. 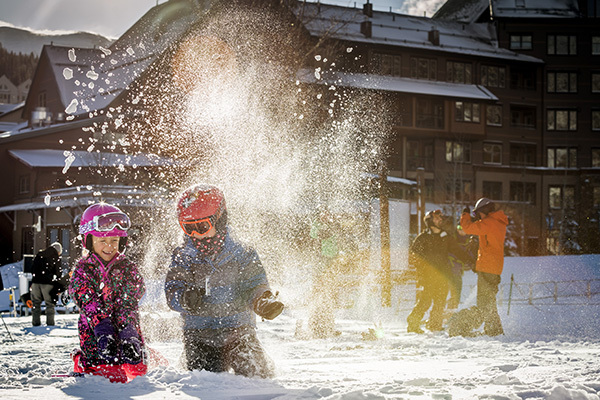 If skiing for the first time, check out nearby resorts. There is no need to travel to the farthest reaches of the state just to try something new. Resorts like Loveland, Eldora, Winter Park and Copper all offer great beginner terrain and are just a short drive from the Front Range. For more information on getting to Colorado’s ski resorts, read Traveling to Colorado. Have any friends or family that ski? Ask for advice on where to go. If they are really a good friend, they might even offer to take you with them! Skiing for the first time alone or with other beginners can be intimidating, so don’t be afraid to ask for help! Plan ahead to stay within budget; no one wants to be greeted with sticker-shock at the ticket window. Lift ticket and rental prices from resort to resort and can fluctuate depending on the time of year, so do your research ahead of time to find what works best for you. Money saving tips and deals are available here: Deals for Beginners. Basically every resort offers beginner ski and snowboard rental packages. If you’re not sure, call and ask! Many ski resorts offer great discounts reserving rentals in advance, so plan ahead and take advantage of the deal. Alternatively retailers, including Christy Sports offer daily and season long rentals for low prices. Some resorts also offer discounts on lift ticket and rental packages, like Monarch Mountain, where ski or snowboard rental and a lift ticket is just $87! Find more rental and lift ticket deals here. In addition to ski or a snowboard equipment, some people also choose to rent outerwear. This is a great idea if you don’t have proper waterproof and cold-weather gear. Loveland and Winter Park offer clothing rental, as do some retailers like MountainThreads. Not sure what to wear when skiing or snowboarding? We suggest checking out our Mountain Basics page for detailed information on proper layering for mountain activities. To sum it up: stay warm and dry! That means: waterproof top and bottom, insulating base layer(s), hat (or helmet!) and gloves. Sunglasses or goggles is highly recommended. As mentioned above, some resorts offer clothing rentals if desired. The easiest way to access Colorado’s mountains is by car. If you do not have access to a car, we suggest carpooling. Carpooling is not only good for your wallet, it’s better for the environment as well. Ride sharing websites can easily help you connect with a ride to the mountains. Shuttle services also provide rides from the Front Range to the mountains. While there are many decent instructional videos on the internet that may help you once you get to the mountain, there is still no better way to learn than a lesson with a professional ski instructor. 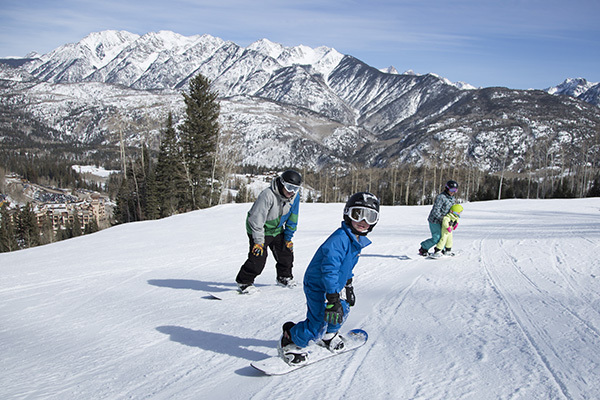 January is Learn to Ski & Snowboard Month in Colorado Ski Country and many resorts offer special promotions and programs to make it easy for people to learn Colorado’s signature winter sports. These promotions often include lift tickets and rentals; so keep an eye out for extra savings in January. 5th Graders who have never skied nor snowboarded and are enrolled in our free Passport Program may be eligible for our First Class Program. This program offers a free beginner ski or snowboard lesson to introduce your child to the sport. More information on the First Class Program can be found here. Planning ahead is essential to securing the best possible lift ticket and rental prices. Many Colorado ski resorts offer steep discounts when lift tickets are purchased in advance. As soon as you your travel dates, buy your lift tickets right away. Click here for beginner specific deals.